From a series of meetings and presentations with investors and advisors around the country in the first three months of this year, tax uncertainty has emerged as the leading financial planning concern. While the passage of federal tax legislation in January brought some clarity, many clients still find aspects of the current law confusing and see the future tax environment as uncertain. Clients were generally relieved that the impact of the “fiscal cliff” was largely averted with the passage of the American Taxpayer Relief Act in January. But confusion remains over how income thresholds are implemented. Many clients want information on when the thresholds kick in, which tax rates were changed by the law, and how their financial plan may be affected. New taxes resulting from separate health-care reform legislation that took effect this year also appear to add to the confusion about tax thresholds. Some clients may be generally aware of the new 3.8% surtax on net investment income and understand that it may impact taxes on interest income, capital gains, and dividends. But most may not be aware of the broad scope of the tax. 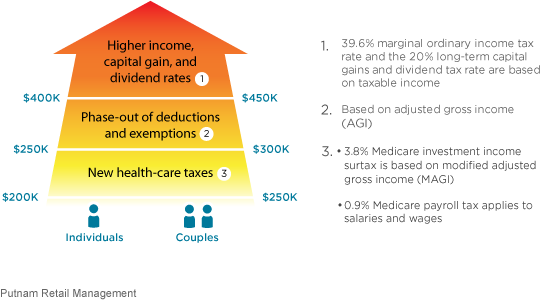 The 3.8% surtax may apply to a range of investment income types, including taxable annuity income, royalties, rental income, and income from passive business activities such as limited partnerships, LLCs, and S Corps. Many clients appear to anticipate additional tax increases in the future as the federal government continues to grapple with budget deficits and growing national debt issues. Competing budget proposals on Capitol Hill for 2014 have fueled this uncertainty by including a range of provisions targeting new revenue sources. With continued confusion and uncertainty around taxes, there is an opportunity for advisors to connect with clients and prospects and provide information and perspective. The tax law also made certain provisions permanent, such as the exemption level for estate and gift taxes. These actions also present opportunities for clients to review their current financial plan with a financial advisor or tax professional, understand the impact of the current tax structure on their investments, and take advantage of tax-efficient planning strategies.